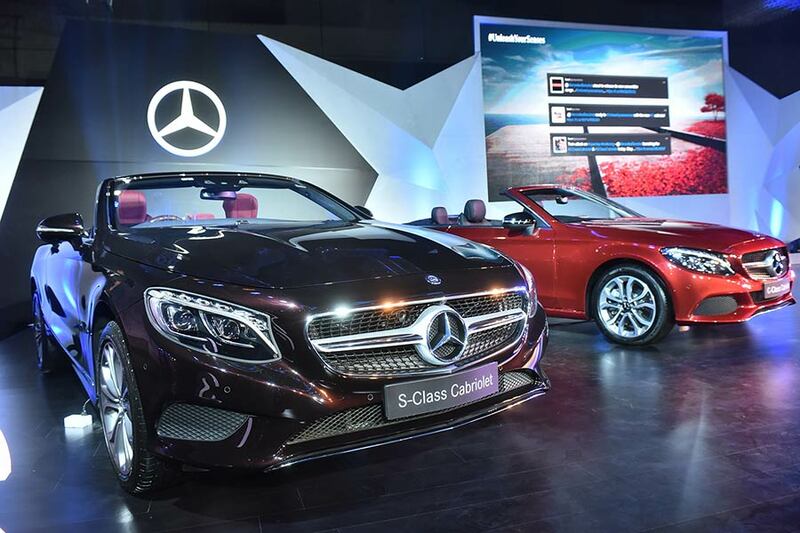 Mercedes-Benz, the country’s largest luxury car maker today redefined luxury open top motoring once again, by launching two fascinating products without a predecessor in India, the C-Class Cabriolet and the S-Class Cabriolet. The S- Class Cabriolet is the first from Mercedes-Benz since 1971 and creates an unsurpassable benchmark with its unmatched style, craftsmanship, innovation and luxury. Mercedes-Benz also introduced in India the first ever cabriolet from the C- Class family, thereby extending its range of cabriolets with new levels of exclusivity, comfort and performance in India’s luxury car segment. 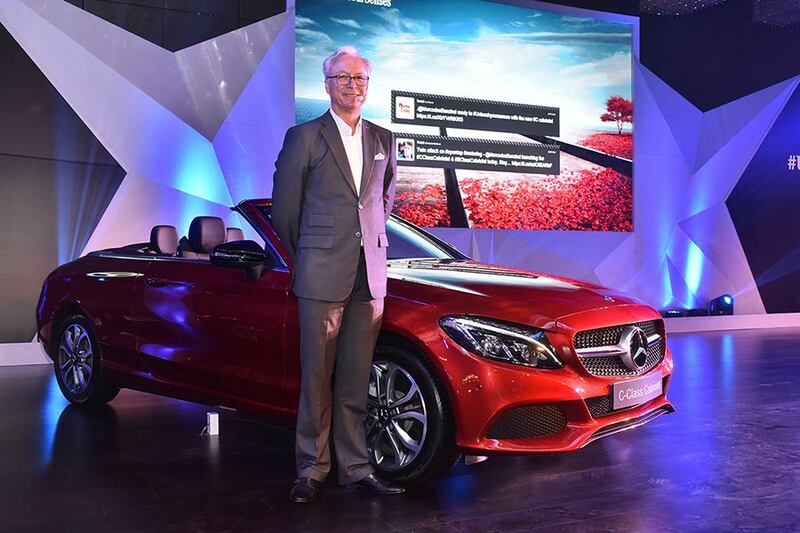 Mercedes-Benz India hosts the largest portfolio of SUVs, performance cars and now, convertibles. 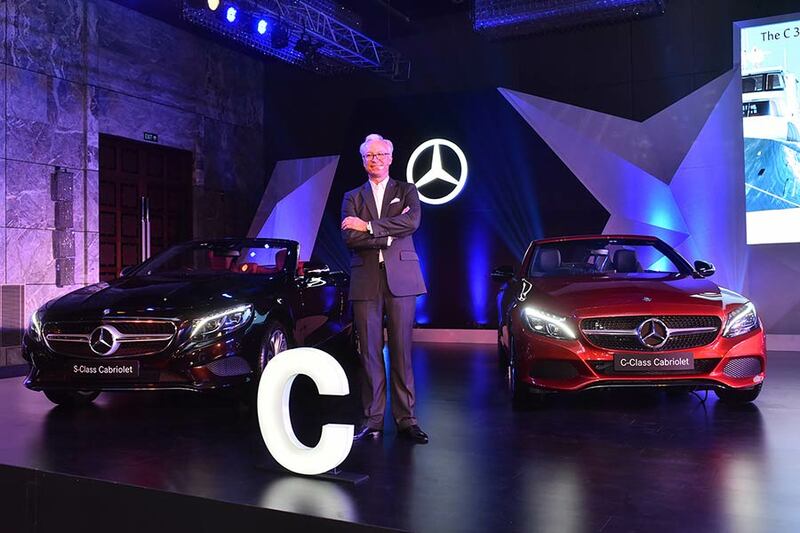 These two stunning cabriolets were launched by Roland Folger, Managing Director and CEO, Mercedes-Benz India and will be available across Mercedes-Benz dealerships across the country. The introduction of C-Class and S-Class Cabriolets in India is an illustration of our ‘top of pyramid’ strategy of bringing in the best of our products from the global portfolio for our distinguished Indian customers. Globally, the C-Class Cabriolet is the first ever cabriolet to be made on the C-Class platform by Mercedes-Benz. 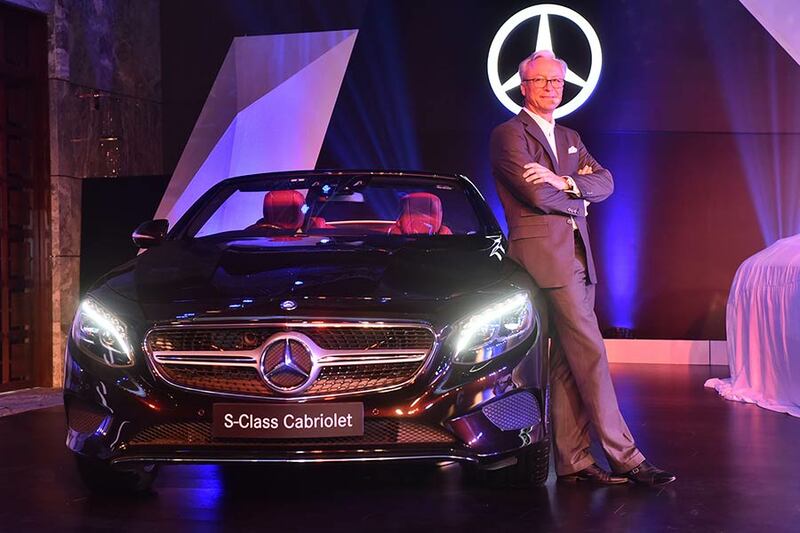 The S-Class Cabriolet is the first cabriolet introduced by the brand since 1971 and also happens to be the first cabriolet based on our flagship S-Class to make its way to India. We are very pleased to offer these two novel products which never had a predecessor in India and we are confident of a strong market response. Today, Mercedes-Benz is synonymous with luxury mobility, and we remain the number one brand of choice for a luxury car buyer. These are our 10th and 11th new product introductions this year and we are extremely satisfied with the way our product strategy has worked and delivered positive customer response. The launch of the cabriolets yet again helps us in cementing our position in the niche dream car segment and offers two new products which are unrivalled. This year, we have already introduced a diverse range of products across segments, which has fascinated our customers and pushed our growth story further. We are confident of maintaining this momentum amidst dynamic market challenges. DYNAMIC SELECT allows the driver to choose their desired setting: sporty, comfortable or fuel-efficient. To this end, the driver can select one of five transmission modes using the DYNAMIC SELECT switch: “ECO”, “Comfort”, “Sport”, “Sport Plus” and “Individual”. 9G-TRONIC Automatic Transmission: Featuring nine forward gears, this automatic transmission takes efficiency, comfort and dynamics to a completely new level. Even faster gear changes and smoother gear shifting make it an enticing proposition. At the same time, the 9G-TRONIC helps to reduce fuel consumption. The occupants enjoy an ambience that, while based on the interior of the C-Class Saloon, offers a fresh interpretation with typical cabriolet features. The C-Class Cabriolet features upholstery in leather, a leather multifunction steering wheel, open pore brown ash wood trim with longitudinal grained aluminum design and integrated analogue clock in the centre console along with the folding rear seat backrests that round off the high-quality equipment level. The electrically adjustable driver’s seat enables convenient and individual adjustment of the seat position and head restraint. Adjustment is carried out via ergonomic switches on the door control panel. The settings can be stored for up to three people and recalled again at any time. The occupants enjoy an ambience that, offers a fresh interpretation with typical cabriolet features. Especially high-grade materials and build quality give the interior a modern feel of sportiness and lifestyle. Interior Lightning in different colouring creates a comfort appeal. Intuitive operation with animations and visual effects is offered by the infotainment system. The C-Class Cabriolet comes with ‘Star Ease’ maintenance package that starts at just Rs. 67,000 (for 2 years) for a hassle free ownership experience. AIRMATIC Suspension: The S-Class Cabriolet is fitted as standard with the AIRMATIC air suspension system including continuously variable damping control. The 4-link front axle impresses with a high level of driving comfort and precise wheel control. The systematic lightweight construction of the Cabriolet enables a reduction in weight. The design of the two-door Cabriolet impresses with a sense of dynamic expressiveness. Flat LED tail lights and the chrome trim which runs above them serve to emphasize the width of the rear end. The striking front section with diamond radiator grille is surrounded by large air intakes and a chrome trim element on the bumper. Finely tailored soft top. Retraction in approximately 17 secs! The interior of the S-Class Cabriolet boasts a sporty, luxurious design language, fine materials and maximum high-class appeal. For maximum individualization, the designo exclusive nappa leather is offered in 6 different color options. The stylishly coordinated combination of high-quality appointments meets the highest expectations with regards to comfort, quality and design. Generous use of exclusive nappa leather and large areas of wood trim enhance the exclusivity of the interior. The effect is heightened by other fine details such as the illuminated door sill panels with “Mercedes-Benz” lettering, the stainless-steel boot sill and the designo headlining, which are trimmed in elegant DINAMICA microfiber. To make every S-Class Cabriolet truly unique in India, Mercedes-Benz India offers more than 13,000 possible customization combinations to ensure no two S- Cabriolets in India are similar. Within a span of 1 year of designo launch, the S-Cabriolet becomes the 8th product addition to the exotic designo platform with extensive customization options.  LED Intelligent Light System with Swarovski Crystals: Swarovski crystal-crowned head lights emitting an emotional appeal of luxury and exclusivity, paired with the Night View Assist Plus ensure a clear view and reinforce the prestigious image of the Three Pointed Star. The vehicle interior can be fragranced to suit personal preference with the AIR- BALANCE package. In addition, the air quality can be improved by ionisation and optimised filtering of the incoming and recirculating air. Fragrance generator in the glove compartment is changeable by exchanging the fragrance flask and Oxygen ionisation for improving air quality and reducing viruses, bacteria or spores. THERMOTRONIC Automatic Climate Control: The automatic climate control system with 2 climate zones and 3 climate modes provides an individual feel-good climate on board. Driver and front passenger can control temperature and air quantity/distribution independently and adjust the temperature in the front foot wells in five stages. Active Parking Assist with PARKTRONIC with 360° Camera: The system automatically steers the vehicle into parallel and end-on parking spaces and leaving parallel spaces, relieving the driver of the work of steering and braking. All this is in addition to the complete 360° camera based surround view of the car for perfect parking. Head-Up Display: Key driver information at a glance, without the driver having to take their eyes off the road the head-up display projects a virtual image measuring. Presentation of information in high-resolution and in color, making it clearly legible even on sunny days and at night. COMMAND Online with Touchpad: Navigation, telephone, audio, video, internet – with the COMAND Online control and display system the driver is able to keep these and many other functions in view and under control. Information is shown in high resolution and in color on the 31.2-cm media display.  Burmester High-end 3D Surround Sound System: The optional surround sound system by Burmester with 23 specially designed speakers, 24 amplifier channels and a total system output of 1520 watts, as well as technologies developed exclusively for the vehicle, ensure an expressive and intriguing 3D sound – the Burmester® “feel-good sound”.  Seat Comfort Package: Multiple massage options integrated in the front seats, accompanied by automated climatisation lead the way to pleasant and relaxing travelling, no matter the distance. Thanks to their inflatable air chambers, the active multi-contour seats with ENERGIZING massage function and dynamic function ensure the best possible seating comfort and outstanding lateral support. crowned head lights emitting an emotional appeal of luxury and exclusivity, paired with the Night View Assist Plus ensure a clear view and reinforce the prestigious image of the three pointed star. The turn indicator with 30 Swarovski crystals sheds light to the eye-catching lines of the headlamps. 17 crystals shine resplendent in the daytime running lamps immediately below. A Swarovski crystal on the front center console adds a touch of sparkle to the interior. The S 500 Cabriolet comes with ‘Star Ease’ maintenance package that starts at just Rs. 73,000 (for 2 years), for a hassle free ownership experience.